Dr.Jean Montrose deals with human weakness and death as a natural part of her profession. But the blood running from under Dr. Diane Shulman’s office door suggest something very unnatural. 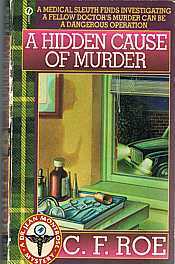 Scotland's Dr. Montrose is terrified when she finds he partner's body. The young physician was a difficult colleague, disrupting their shared office by treating drug addicts and alcoholics. Now she fears Diane's choice of patients got her killed.